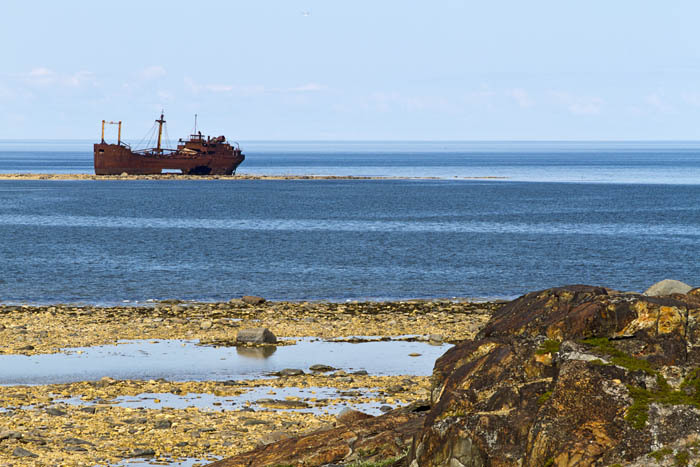 Comments: The 260 foot (80-metre) long wreck of the MV Ithaca sits just outside Bird Cove, 12 miles east of Churchill, high and dry when the tide is low and surrounded by water when the tide is in. According to Lloyds of London (the company insuring the Ithaca), it was a British-flagged steamship, built in 1922 at Three Rivers, Quebec. Its rudder broke in an eighty mile an hour gale and it ran aground at this site on 14 September 1960. For a while, the ship became a local party boat. Hikers can walk to it on low tide.